Uh oh. Pop quiz. What do you think these four scenarios have in common? She can break a crystal goblet with her voice, and I can’t. My “flip-flopping” mental chatter in my head keeps me from making decisions. The Islands experience larger waves than the Bay shores do. A typical light bulb can’t cut through steel like a laser might. The answer to the question is “Frequency“. What? How? When you get those little waves in sync, a single frequency strengthens itself, they reinforce each other and it’s technically called Constructive Interference. It can create a wave height TWICE the height as the original wave! This explains the strength of single wave-lengths in water over long distances against an island shore; or the ability of focused sound waves from a singer’s trained voice; or the power of your own trained Thought Energy. 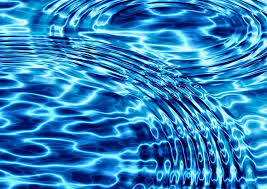 As they synchronize, or FLOW together in ONE frequency, they gain Power. When you have out of sync wavelengths you have hills and valleys that “hit” each other, and cancel each other out. This is called Destructive Interference. That explains why my changing frequency while “singing” won’t shatter a glass. It also explains the less powerful, choppier waves inside the bay or the bathtub, and the light bulb that emits a wide range of light frequencies that can’t cut through metal. All of this can be thought of as a type of friction, or loss of Power. Remember that Thoughts are just patterns of Energy. In our thinking, we sacrifice Power when we scatter our thought frequencies. It’s like the Physical thoughts that we have around us all day in emails, social media constantly pinging us, phones calling us, etc.. They can be quite seductive in pulling you away, scattering your focus, from what you wanted or intended to do. By trying to answer every social media ping, or call or email as they happen, you’ve given up control of what YOU want, of your Intention. Our own Thinking also pings us constantly, as well, in the form of your mental chatter. We may want this, but that might happen…. We have to get this done but first need to do that…. It seems like every day we create choppy, scattered, thought frequencies, and live in the midst of Destructive Interference. Our Power is regained when we focus, Entrain, our thought frequencies to a single Intent. That is the beauty of asking for, or knowing your Main Intention – (singular focus in life or for a day or for the present). That is the strength of living in the present moment (a singular thought). That is the Power of Meditating or Cultivating your Thoughts. Think of it like this- You are stronger and more stable while you focus upon being the hillside, rather than the cows on it. The cows are merely destructive Interfering thoughts, that ramble back and forth across your mental pastures all day. This week, try to decrease your unwanted mental chatter, focus like a laser, purposefully and effectively make the waves you want and see what old destructive patterns you can shatter!